Control of other applications via "interworking"
The CTI Server enables the network deployment of several xtelsio CTI Clients. Both telephone systems with central TAPI driver and local TAPI/CTI connection are supported. 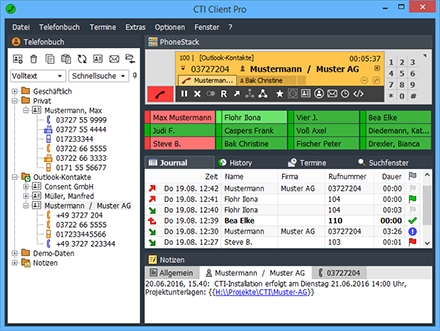 An offline call journal also logs calls for logged-off client PCs. By TAPI monitoring and presence management, you can always see which of your colleagues is currently available. The TAPI driver for snom phones supports i.a. dial, hang up and call signaling. This allows direct dialing in Outlook® or other TAPI-enabled applications. The TAPI driver for Asterisk-based PBXs supports i.a. dial, hang up and call signaling for all connected phones.